To achieve our mission, we set 5 concrete goals that drive our projects and services. We aim for these services to be accessible to local and international artists and creative entrepreneurs, as well as youth and families. At 555 Arts, we provide affordable space to let your creative juices out. Spaces range in size and we are working to build more studios at our new location on Warren. Stay tuned for updates! At 555, we believe you should never stop growing and pushing yourself as an artist - but you should not have to drain your savings to learn. We provide classes and workshops at affordable rates to help you constantly develop artistically. From walls for exhibiting your art to spaces to perform your production, 555 can facilitate displaying your creativity. Spaces range in size and type, and we are currently constructing more at our new Eastside Detroit location. Stay tuned for more details! In addition to spaces to work and perform, 555 is home to artists in residence - providing a place to live in and work in community with other artists. We hope our residency program fosters collaboration and provides a safe space for artists to be creative. We at 555 believe that art should not be confined to indoor spaces where you live or work and that it has infinite power to affect the community. We support art for public spaces around Detroit and beyond. Our new Art Park space will provide space for public installations and a Foundry to create new works. 555 Nonprofit Gallery & Studios is a 501(c)3 nonprofit in Detroit, Michigan. The organization was originally founded in Ann Arbor, Michigan in 2002 by Carl W. Goines, Jacob "Monte" Martinez, and Andres Garces. After working together and getting to know one another at the University of Michigan the 3 found themselves cleaning up 50 years of industrial grime to create a gallery and studio space for exhibiting their works as well as local, national, and international artists, activists, and musicians . From its beginnings as a small artist studio collective, 555 quickly grew to include multiple artists and began hosting events that offered an alternative for emerging artists to show work in the Ann Arbor area. After the city decided to reclaim the building 555 inhabited, the group moved to Ypsilanti in 2003 to renovate an old warehouse on Michigan Avenue. The group continued to grow and mature, until the city of Ypsilanti decided to create condos where the warehouse stood. So once again in 2004, 555 was on the move - and this time chose to make the leap to Detroit. The move to Detroit expanded the audience and diversified artist membership for the organization. Starting at 4884 Grand River Ave 555 leased and renovated a 13,000 sq.ft. warehouse into artists studios, galleries, event space, and work space. Landlord issues pushed 555 to make a move after investing 1000's of hours of volunteer time and monies into the warehouse. Southwest Housing Solutions offered to house 555 in a warehouse in SW Detroit at 5716 Michigan Ave.
555 most recently occupied the former Detroit Police Department's Third Precinct in southwest Detroit where we converted the precinct into gallery and event space, the jail cells into artists studios, held educational arts programming, created public art, and collaborated with the community in as many ways as possible on a shoe string budget. As an all-volunteer-operated organization, the people of 555 are passionate and devoted to their mission and values, and continue to create community, new public works, and opportunities to learn and connect. We are renovating a 30,000 sq.ft. commercial building, an outdoor art park with Foundry, and a residential home on the East side of Detroit. Together with the community, we seek to build living and working space for artists, commercial and event space for the community, an outdoor park for events and public art displays, and a Foundry to bring even more talented creators to the area. We envision a permanent safe-haven for artists, prioritizing their needs and building relationships in the community. Carl is the founder and executive director 555 Nonprofit Gallery and Studios (555). Carl has lead the organization for 14 years successfully establishing nonprofit status as a 501(c)3 organization to support the arts. Since 2002 he has lead the selection of locations to house facilities for 555’s programming including leasing and renovation space in Ann Arbor MI, Ypsilanti MI, and Detroit MI. Carl managed, renovated, leased spaces for the arts from 2000 sq. ft. to 13,000 sq. ft. in 7 different locations. In each location artists studios, gallery space, and education programming were established serving an estimated total of 13,000 artists and public attendants. In 2010 he negotiated the purchase of 555’s first permanent location at 2941 E. Warren Ave Detroit 48207 a 30,000 sq. ft. 4 story facility to be known as the 555 Banner Tobacco Building which is adjacent to the properties of the proposed 555 Art Park and Outdoor Foundry. Carl has also worked in the construction industry since 1997 training in renovation, carpentry, and construction. Carl holds a Bachelor of Fine Arts in Sculpture from the University of Michigan. He also has public art projects installed in the city of Detroit and the city of Howell MI. Trevor is an artist, teacher, community builder, social justice activist and social sculptor whose primary mission is to help the local community shape 555’s programming to suit their needs. He will take a lead on fostering sustainable community partnerships, developing outreach/promotion methods to engage locals, creating feedback/authorship methods so the community can easily help shape 555’s programming and structuring an inclusive community at the art park. Trevor specializes in transforming empty spaces into communal, collaborative, interactive and entertaining art environments. Many of his community building methods were developed through my performance art, which has been exhibited at venues like the Smithsonian American Art Museum, MOCAD and the Museum of Contemporary Art in Chicago. He uses the exact same interactive principals to create engagement, facilitate crowd participation, foster group connectivity and design experiential learning at museums/festivals as he does in community art spaces. Another influence on his methods was working at the Neutral Zone, a leadership incubator for high school students interested in the arts and social justice. There he received intensive leadership training on how to transform groups of strangers into highly cohesive communities, which also helps maximizes engagement in art spaces. Recently Trevor has been serving as a consultant to/liaison for community building, anti-gentrification and social justice projects around Washtenaw County. Trevor also teaches for Eastern Michigan University and Jackson College. Trevor holds a Bachelor of Fine Arts from the University of Michigan, a Masters of Fine Arts from the California College of the Arts, and a Visual Arts Teaching Certificate from Eastern Michigan University. Casey founded Carbon Arts, a non-profit organization founded in Detroit in 2011. The purpose of this organization is to teach the art of iron casting and sculpture to all people who are interested in the foundry process and iron pours as performance. Casey designed the cupolas and iron pour of a 25 ton sculpture for Matthew Barney’s film “KHU”, which was filmed in the Detroit area in 2010. Westbrook decided to start the organization in Detroit after developing a relationship with local artists while on location shooting “KHU”, where the history, readily available resources, and local artisans were supportive of their cause. Carbon Arts brings the art of iron casting to people through a series of workshops previously not offered outside of industry or the collegiate setting. Carbon Arts offer hands –on experience, learning the process from cupola (furnace) construction, to casting of the final, finished piece of iron art. Casey works to develop workshops that are tailored to both individual and group needs. Young and old, novice and experienced, all are welcome. Casey’s technical expertise in cupola construction and program development will be an asset to the creation of the 555 Art Park and outdoor Foundry. 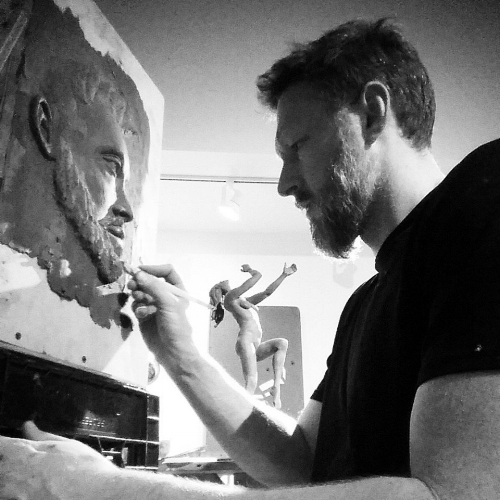 Casey holds a Bachelor of Fine Arts in Sculpture from the State University of Georgia and a Masters of Fine art from Kansas State University. He has exhibited work nationally and internationally as well as designed and developed foundry programs nation wide.